Is the solar bike for sale? What is the use of the solar panels? You would think that the use of the PV panels is obvious, but many people wonder what they are for. The solar panels generate the power for the motor. Temporarily, a front hub motor is used, but the solar bike requires a very high efficient mid drive motor. Unfortunately, no available motor satisfies, all are far too heavy and not efficient enough. Therefore, I’m currently developing a new mid drive motor. The mid drive motor will be unsurpassed: the efficiency is above 90% in the whole range and the weight is just about 1kg. The motor power is 1500W but will be limited to about 350W. Should we additional pedal too? At sunny summer weather, you don't need to pedal at all. What is the speed by solar energy? On flat roads, a speed of 15mph or 25km/h is easily achieved. With a little additional pedalling you easily reach 19mph or 30km/h. What is the average solar power? The rated power is 240W. At full sun, the power is usually between 160W and 200W. Note, the panels are cooled by the air stream, this is an important factor that increase the solar power. What is the maximum solar power? Sometimes, the PV panels deliver 250W. If the panels were faced to the sun, this would be 300W. Thus, the PV power can be higher than the rated power. This occurs at partly cloudy weather. When the sun shines through the clouds, the PV panels receive the direct sunlight but also sunlight reflected by the clouds. Even on semi-cloudy days or at low sun, the solar panels deliver usually more than 100W; this gives still substantial pedal support. Can the PV panels be removed? The panels can be removed in a few seconds. Do the solar panels suffer from shadow as do usual PV panels? Because the bicycle is regularly shaded, the panels and their electronics have a special design which effectively reduces the shadow influence. What is the bike at the photos? The photos are made of the Maxun One prototype. Are the solar panels not dangerous while driving? Some people find the solar bike dangerous. But what about cars and trucks racing along cyclists? That’s seriously dangerous. Compared to that, the solar bike is harmless. The solar panels automatically move away should a collision occur. Why does it have a battery? The solar bike needs a small battery because the instantaneous power, for example at acceleration or at uphill, may be larger than the solar panels provide. In addition, the electronics requires a battery. However, if sufficient solar energy is received, the battery doesn't have to deliver any power. Should the battery be charged? At accelerating and driving uphill with motor support, the battery is needed, which has to be sufficiently charged by the solar panels on the go. Therefore we need to save energy on flat roads so that solar energy is left over to charge the battery. Is it stable at parking? The solar bike has a very stable side stand for parking. But with strong winds, the solar bike must be parked against a pole or tree. Is absence of sun a problem? In absence of sun we have to pedal when the battery is empty also. But the Maxun One rides almost as light as a road bike because the panels form no additional wind load. The motor power is 250W (limited by law in Europe), that does not seem much but it's enough for a speed of 27km/h. Do not compare the light running Maxun One solar bike with a common energy guzzling heavy e-bike. It makes no sense to use a bigger motor, there is not more solar energy available. In the future, a mid drive motor will be used instead of the front motor, which will increase the uphill performance a lot. Is the bike sensitive to side winds? Even strong wind is no problem because there has been made much effort to minimize the side wind sensitivity. What is the speed uphill? With the temporarily front hub motor, you have to additional pedal a little uphill to supply extra energy, but most energy comes from the motor. 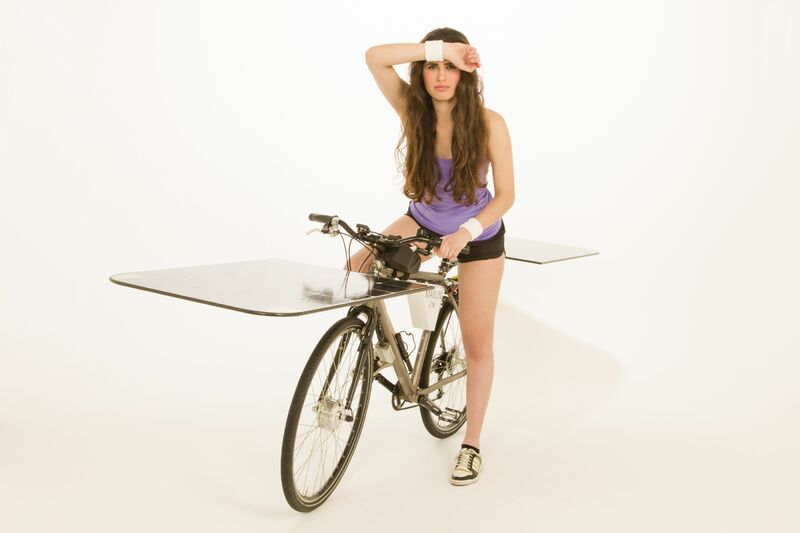 Yes, although the solar bike looks uncomplicated. But it is very difficult to come out to a simple looking solution. What is the action radius? You can ride 100km or more a day entirely solar powered, so without pedalling or using battery energy. What is the advantage over a ebike with just a battery? The solar panels can provide an energy of 1500Wh per day. A high quality battery of this size has a weight of at least 15kg. Can the solar panels be made smaller? There is no trick which makes it possible to use much smaller PV panels. With the use of aerospace solar cells, which have the highest efficiency, the panel size can be reduced with 25%, but these would make the Maxun One $100,000 more expensive. The received solar energy is proportional to the surface area of the PV panels and so a smaller size means less power. Note that vertical panels receive just very little solar energy. The solar panels may seem large at first glance, but that's because you haven't seen them before. After a while you don't know better and they seem rather small. 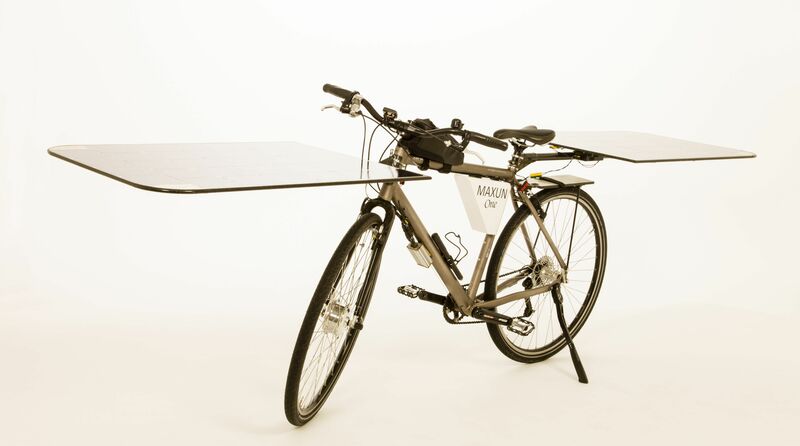 Furthermore, the solar bike is not larger than a child transport bicycle. So it is not necessary to reduce the solar panels and we don't want to reduce solar power. How long takes battery charging during parking? If the battery is completely discharged, recharging by the PV panels takes about one hour. What is used, a throttle or pedal assist? Pedal assist don't give direct motor control, so we use a throttle with up / down push-buttons. Also paddle assists is pointless here because most of the time you don't have to pedal at all. The bike is much faster than a normal bike, but if you take the time into account that you spend with answering questions from interested people, the bike is just as fast.